chaises longues pour les clients que nous estimons est essentiel car très peu de lits complexes disponibles. Salle de bain avec baignoire et douche puissante. Wifi gratuit. Salle de bain a lavabo, d'une baignoire pleine grandeur, la puissance superbe douche et WC. Moustiquaires placés devant les fenêtres coulissantes. 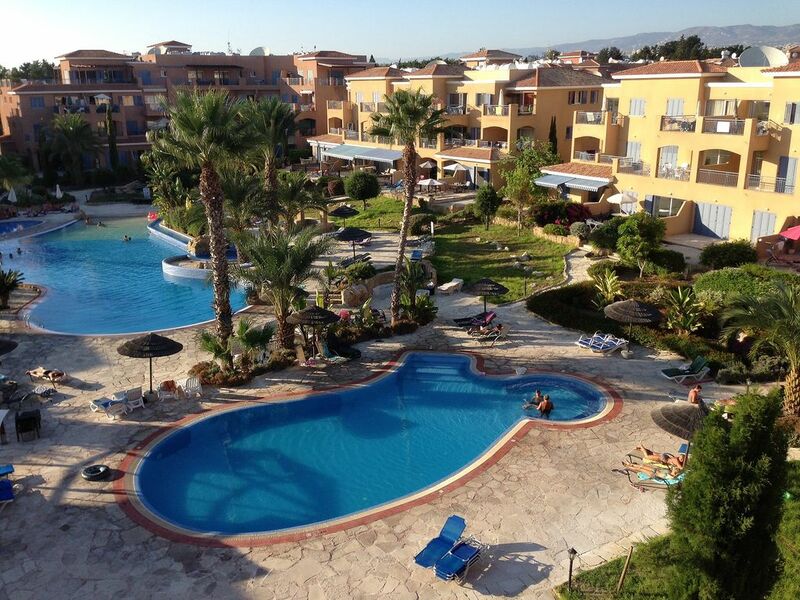 Well equipped two bed apartment in a very well maintained moderate to large complex with feature pools. Located about 1 km or 12 mins easy walk down to Paphos harbour area with lots of bars, restaurants and shops. Similar distance to the kings mall for retail therapy. The apartment was well set up for use in the winter with sufficient heating and quilts etc. There was also a good tv and movie package together with private WiFi within the apartment. Decent furnishing and plenty of crockery etc. The apartment was clean and tidy. The owner is very helpful and answered questions quickly via email. He provided all the necessary information and there was plenty of info about local restaurants and attractions in the apartment. Enjoyed our stay. Many thanks. The apartment was superb. Had everything we needed and more. Clean, comfortable and good location. Very handy that the owner had folders with local info on restaurants, travel etc, really useful. Pools were fab. A short walk to beach and restaurants. Brilliant holiday, would definitely recommend and would love to go back. We have just returned from a 2 week stay at Limnaria Gardens. Gordon was a perfect host, providing lots of information before our arrival and he was always on hand to answer any questions. The apartment is clean and spacious and has a lovely balcony with a large table and chairs where we had breakfast and lunch most days. There is a nice view of the pools. The air conditioning units in all the rooms are needed and work well along with the ceiling fans. The blackout shutters and double glazed windows make for a peaceful nights sleep. There is ample hot water and a good shower. The wifi is a great addition and works really well. There are loads of TV channels and despite the occasional lagging we watched most of the World Cup without many issues. You don't need to bring any books as there are dozens in the bookcase! The location is also good being a few minutes stroll to the sea and then beautiful walks along the coastal path in both directions. There are lots of bars and restaurants to choose from. The main supermarket is a 15 to 20 minute walk into town but a shopping trolley is provided which makes things much easier. Just a couple of suggestions; a small pedal bin in the bathroom, especially for the ladies would be useful and a wall clock somewhere in the living area. Overall this is a very nice, well equipped, good value apartment and the only reason I don't give 5 stars is that the bed was a little too firm for me, but everything else was great. We would definitely recommend it and would return again in the future. Good points raised re a Bin in the Toilet and a Wall clock in the lounge area will both be done on 26 th July 2018 . Overall a very good review in line with previous comments . We had a lovely time in Gordon's apartment. He had thought of everything and left comprehensive instructions on the apartment, the complex and the town. We spent our days laying by the pool who Gordon's own sun loungers and enjoyed tea and coffee on the private balcony every morning. It was clean and comfortable. We had a hire car and there was plenty of off street car parking. Easy walking distance to shops, bars, restaurants and the harbour area. Clean & comfortable first floor apartment with spacious balcony overlooking lovely gardens. We stayed at the apartment in February so as you may expect it was very quiet. The gardens and pools were well maintained and gave us a lovely view from the first floor balcony. Gordon’s apartment was clean, tidy and comfortable, it has a well equipped kitchen area which meant we could prepare almost any type of meal if we preferred not to go to a restaurant. He provided some detailed information before our stay and it would have been easy to contact him should we have needed any further help. We would certainly recommend this apartment and hopefully use it again on a future visit to Paphos. An accurate review as an owner our aim is to provide full satisfaction to all our guests and this was good to see from a first time stayer . Seulement 5 minutes à pied de la plage publique la plus proche à côté de Alexander The Great Beach Hôtel. Il ya une belle promenade maintenant terminé qui vous emmène sur le front de mer du port ou de l'autre manière après la série d'hôtels 5 étoiles. Les plages de Coral Bay et Coralia Bay et Geriskipou sont faciles à atteindre par les bus locaux de la fin de la route 250 yards loin. Les bus sont à seulement 1 Euro par voyage ou 3 euros pour les billets Jour. Aéroport le plus proche est Paphos 9 miles loin, taxis toujours disponible au bureau de taxi juste à l'extérieur de la sortie de l'aéroport, pas de nécessité de pré-réserver, cependant suggérez vous voudrez peut-voyage de retour de livre avec chauffeur de taxi mais encore une fois beaucoup de taxis. Le coût est d'environ 30 Euros, demandent toujours premier prix lors de l'obtention Airport Taxi. Les bus publics fonctionnent maintenant aussi à Paphos aéroport coûte 1 et demi d'euros dans chaque sens qu'ils garent borne juste à l'extérieur. L'aéroport de Larnaca est une & une demi-heure et les taxis sont chers, donc Paphos est le meilleur choix. Latchi et Polis stations balnéaires sur la côte Ouest sont sur un 30 km en voiture à travers la campagne spectaculaire bien indiquée. Le Akamas péninsulaire commence à environ 10 miles à Aghios Georgios. Troodos Mountains est un environ 1 et demi à deux heures de route. Limassol est de 42 miles à l'aide de l'autoroute ou pittoresque côtiers La route B6. Paphos Old Town est à 2 miles de là, les bus locaux vont de la fin de la route via la gare routière Harbour toutes les 10 minutes. Coral Bay est de 6 miles, un bus de notre côté de la route va toutes les 10 minutes par l'intermédiaire Harbour. 4 très bons restaurants / tavernes sont à seulement 150 yards loin juste en bas de Paphos Gardens Hôtel sur la route de côté près de l'Hôtel Aloe. Si vous vous dirigez vers le centre-ville à moins de 250 verges ou plus, vous arriverez à une rangée de 6 tavernes tous offrant 3 cours des repas du soir pour environ 10 à 12 Euros et tous très bons.